Lincoln City Oregon has a diverse history, particularly since it is the amalgamation of 5 small towns. It now stretches along the Pacific Coast Highway for about 8 miles. However, this area was home to the Siletz band, rugged, and relatively untouched in the past. Settlement began when fisherman came to the area for the prolific salmon stocks. Homesteaders followed soon after as the Dawes Act in 1887 offered eighty acre allotments to Native Americans and settlers. Consequently, many people began to populate the coast to forge new communities. By 1926, the completed Roosevelt Highway provided a passable roadway between Taft and Newport, Oregon. These were very isolated areas until that time, but the new road made it much more accessible. Eventually, the Roosevelt Highway became part of coastal Highway 101, bridging the Washington, Oregon, and California coastlines. Records indicate the name of one town became “Oceanlake” due to its position between Devil’s Lake and the Pacific Ocean. Apparently, they hadn’t needed a name until the post office opened in 1926. Oceanlake, along with Delake, Taft and the communities of Cutler City and Nelscott united to become Lincoln City in 1965. Today, officials refer to the original communities as the “String of Pearls”. Each retains its brilliance and unique characteristics. 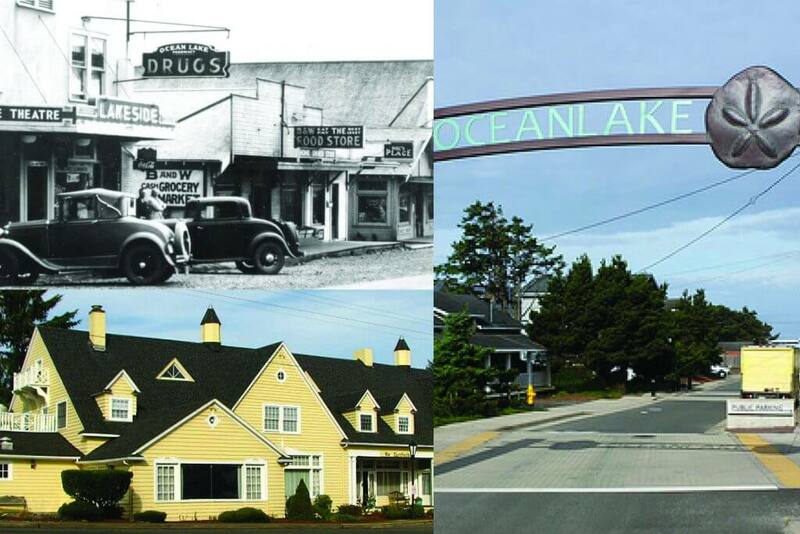 Oceanlake did not become a city until 1945, and it is now the principle shopping district and business region of Lincoln City. Its urban renewal project widened the highway and tucked utility wires away, but it still retains its small town charm. The Oceanlake arch with sand dollars on each side marks the entrance to the area. The snapshot from the North Lincoln County Historical Museum archives shows the old Lakeside Theater. Today, it is the Bijou theater showing classic films, befitting its Art Deco architecture and roots. Before the antique and gift shops and a 50’s-style ice cream parlor with memorabilia, you’ll find Oceanlake sidewalks adorned with 65 artistic glass inlays. You’ll also find a statue of Abraham Lincoln here and the colonial-style Dorchester House, completed in 1935. It is on the National Register of Historic Places. It was home to the oldest annual political conferences in the nation. Oceanlake and Lincoln City have much more to offer. No matter what time of the year you choose to visit, the Oregon Coast is an ideal holiday location. You can watch grey whales, go crabbing for Dungeness crab, or hire a boat for some incredible fishing. The restaurants offer fresh local fare and world-class chefs and you’ll find many microbreweries in the area too. If you’re itching to explore, why not stay in one of our Lincoln City beach rentals? They’re the ideal spot to use as a comfortable, affordable home base while you explore Oceanlake and everything it has to offer. Rentals include stunning ocean views and high-end amenities including HDTV, wireless internet, an exercise room, a heated indoor pool and a games room, just to name a few. Why stay in a stuffy, pricey hotel when you can stay in a spacious, well-appointed condominium instead?